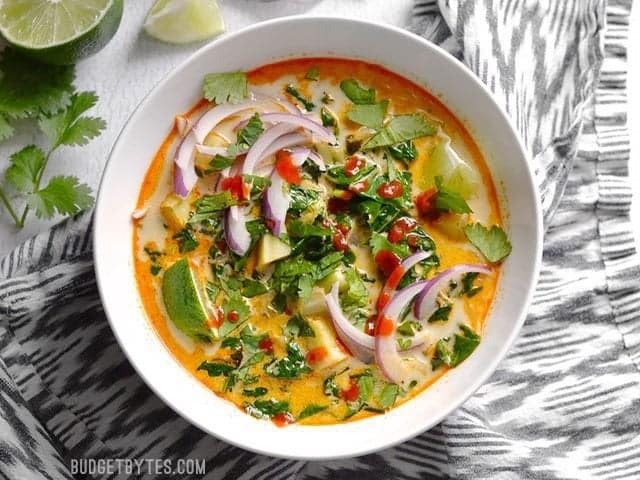 I happened to go to an Asian market yesterday where I picked up the ingredients for this soup (at really amazing prices, I might add), but if you can’t get the same vegetables as me, you can still make this Thai Curry Vegetable Soup! 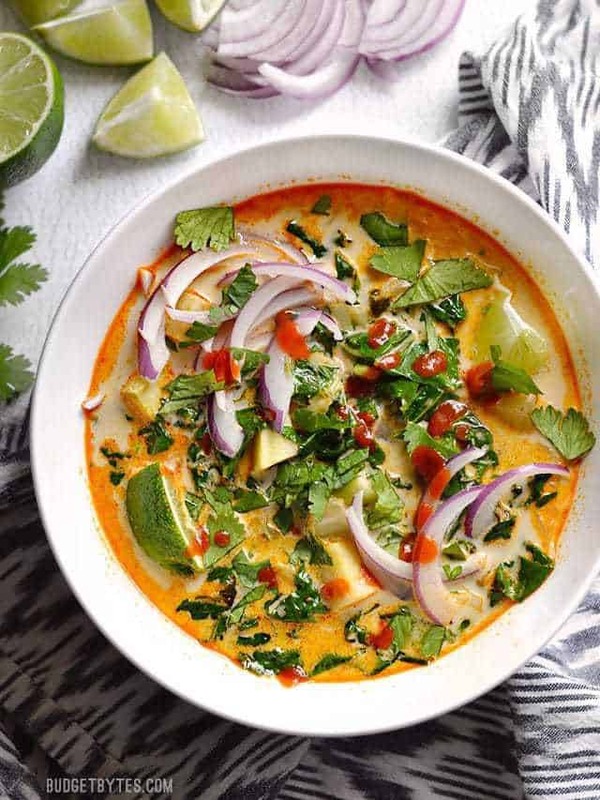 The beauty of this Thai Curry Vegetable Soup is that you can use just about any vegetable you like, although I try to at least have some sort of leafy green. Other vegetables that would be great choices include: spinach, kale, collard greens, cabbage, mushrooms, bean sprouts, snow peas, carrots, or red bell peppers. I made a vegetarian version (minus the fish sauce, anyway) today, but you could easily add meat to this soup. 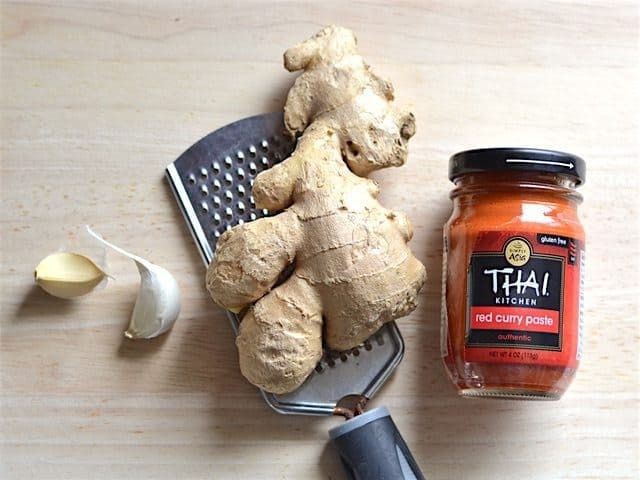 Toss in some shredded rotisserie chicken, or brown some chicken pieces in the beginning with the Thai curry paste. 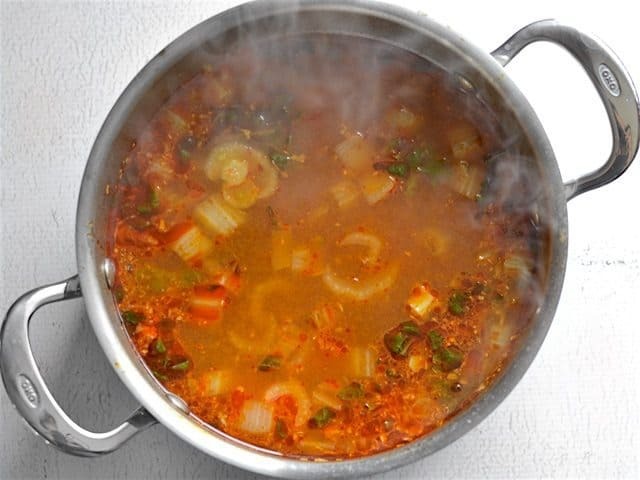 If you prefer shrimp, I suggest adding it at the end and simmering just a few minutes, or until the shrimp turn pink. And what about the noodles? That’s customizable, too! You can skip the noodles all together if you want, or use a brick of cheap-o ramen if that’s what you have. It’s still going to taste amazing. 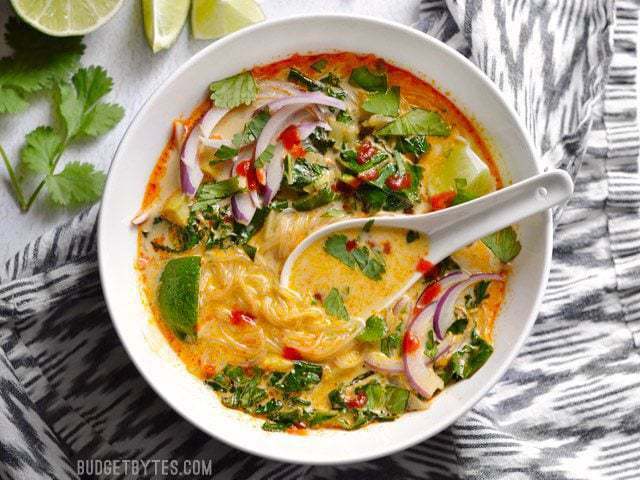 Easy, flavorful, and customizable–This Thai Curry Vegetable Soup is EXACTLY Budget Bytes style. Prepare the vegetables for the soup and garnishes first, so they're ready to go when needed. 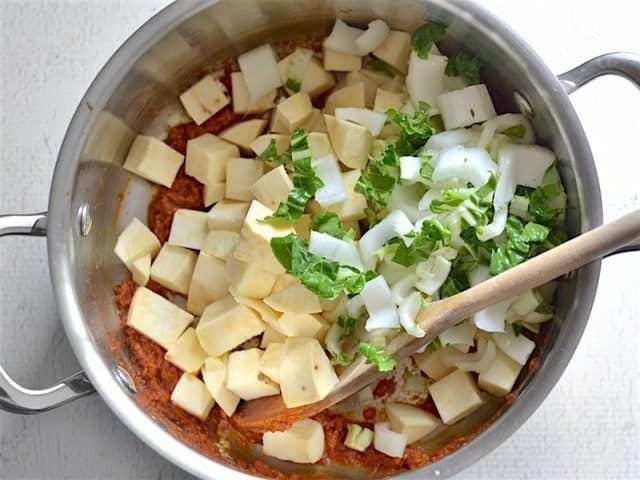 Mince the garlic and grate the ginger using a small-holed cheese grater. Peel and dice the sweet potato into one-inch cubes. Wash the bok choy well, then chop into one-inch strips, separating the fibrous stalks from the delicate green ends. Thinly slice the red onion and roughly chop the cilantro. *Use any neutral (low flavor) cooking oil, like vegetable, corn, canola, sunflower, grapeseed, or peanut. How gorgeous are those colors?? Start by preparing your vegetables, so they’re ready to use when you need them. 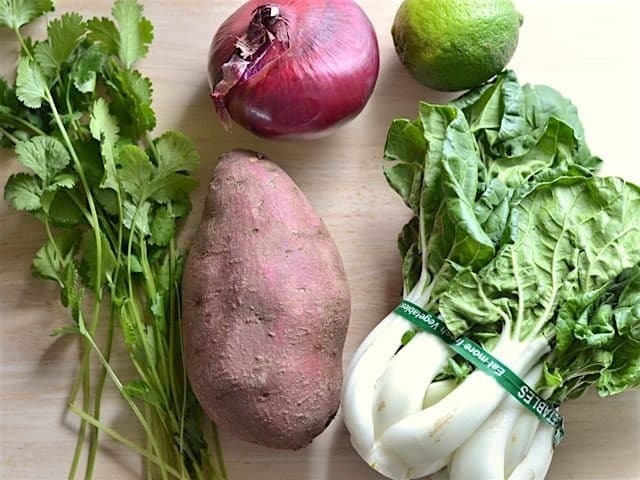 I just happened to go to an Asian market the day before, so I picked up this Japanese yam, baby bok choy, limes, cilantro, and a red onion. Read through the intro if you need ideas for alternate vegetables. Peel and dice the yam (or sweet potato, either will work), thinly slice the red onion, cut the limes into wedges, and cut the bok choy into strips. 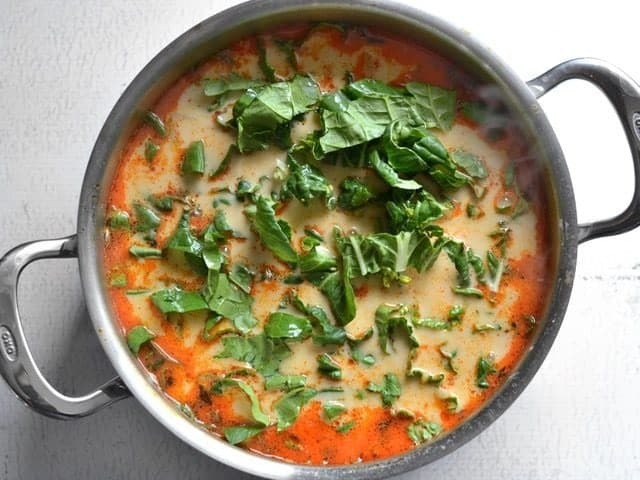 Try to keep the stalk end and the leafy green ends separate, as you’ll add them to the Thai Curry Vegetable Soup at different times. 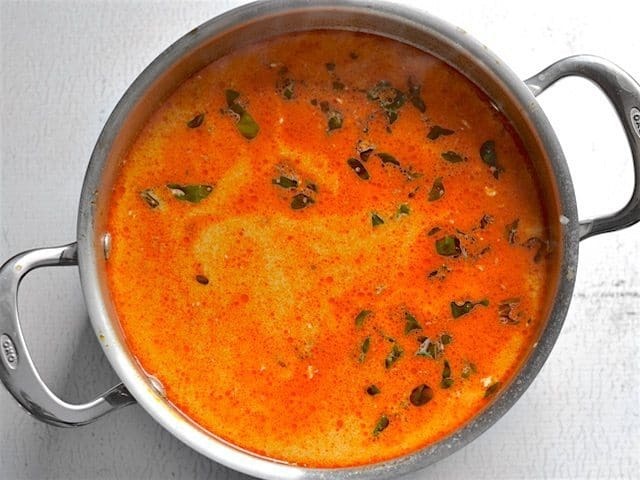 Add a couple tablespoons of any neutral cooking oil (like canola, vegetable, peanut, sunflower, grapeseed), the minced garlic, grated ginger, and 2 Tbsp of the Thai red curry paste to a large pot. 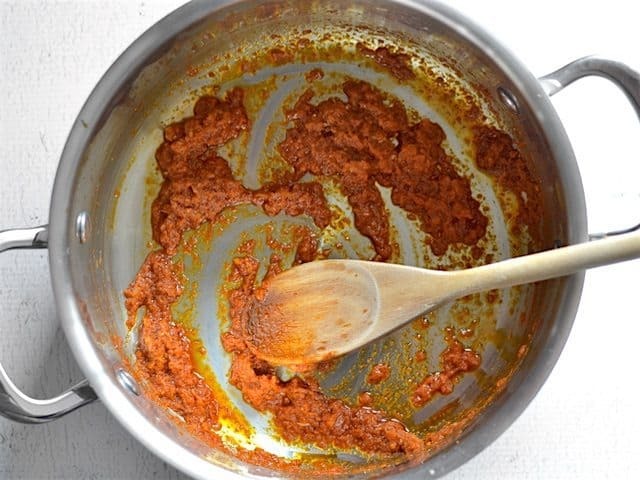 Sauté the garlic, ginger, and curry paste over medium heat for 1-2 minutes. Next add the hard vegetables, in this case the yam (or sweet potato) and stalks of the bok choy, so they can simmer in the soup and soften. Add four cups of vegetable or chicken broth, place a lid on top, turn the heat up to medium-high, and bring to a boil. Once it reaches a boil, reduce the heat to low and simmer for 5-7 minutes, or until the sweet potato is soft. 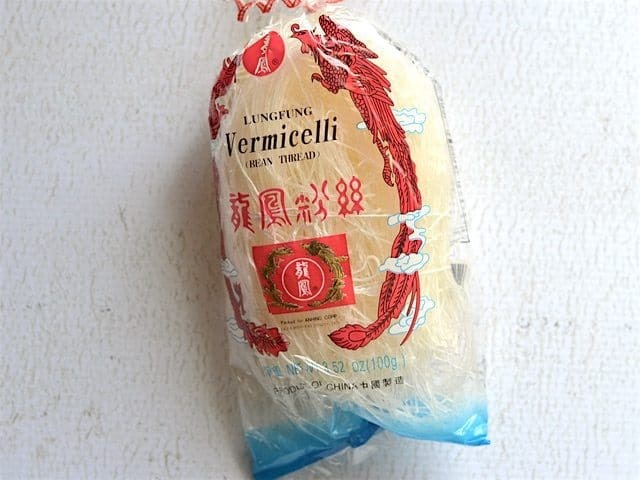 While the soup is simmering, I cooked the rice vermicelli separately (this package is 3.5oz). The reason I cooked the noodles separately is because they cook super fast and I didn’t want them to over cook in the soup. I might, at some point in the future, add them to the soup at the end and let them soften that way, but today I wanted to be extra sure, so I just cooked them separately. 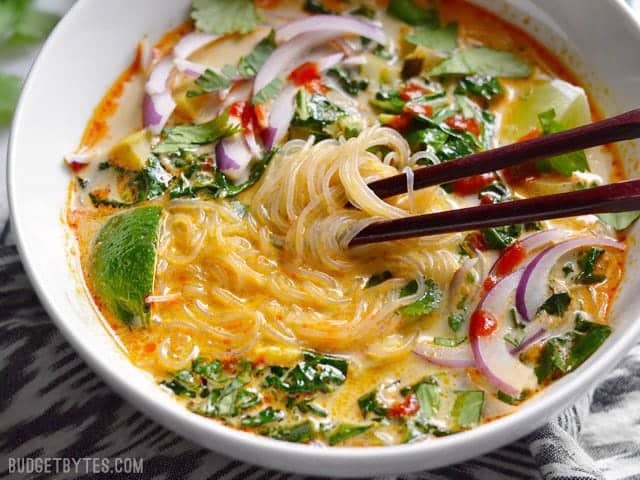 They only take about 2-3 minutes to soften in boiling water, then drain the noodles in a colander and set aside. Back to the soup pot. Once the sweet potato cubes are soft, add a 13oz. 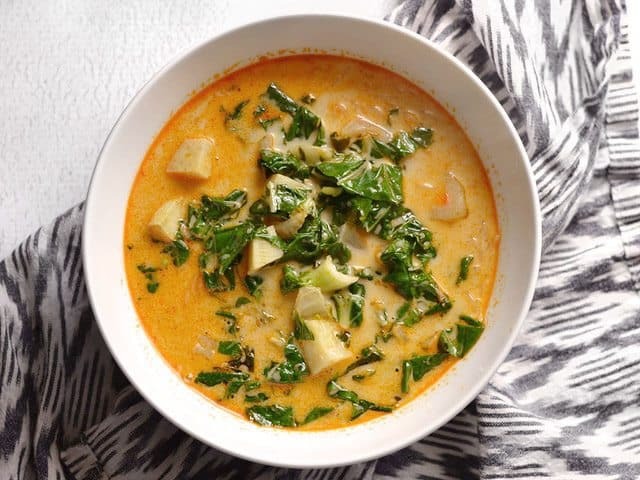 can of coconut milk, which transforms the soup into this creamy goodness. Also add 1/2 Tbsp fish sauce and 1/2 Tbsp brown sugar. 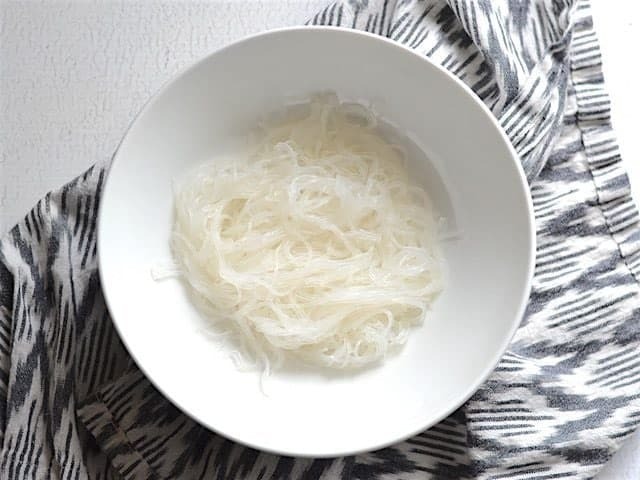 Now, if you’ve never used fish sauce let me just tell you that it is very potent and doesn’t smell good, but because it’s used in such small quantities, that doesn’t really transfer to the dish you’re adding it to. 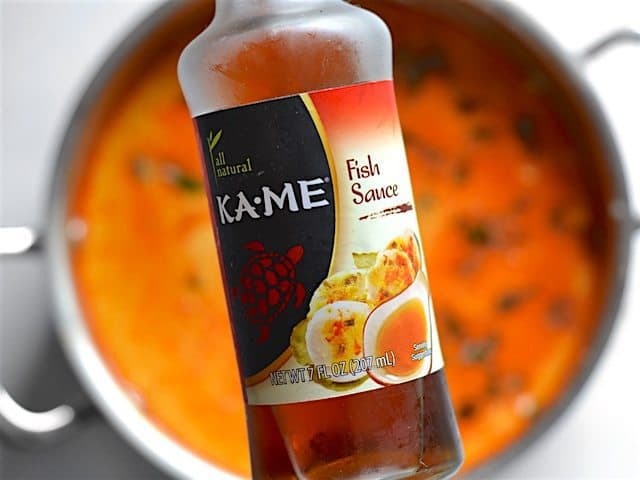 It just adds a subtle umami flavor and a bit of saltiness. If you can’t get fish sauce or want this dish to be vegetarian, you can leave it out. It still tastes good, but IMHO will be missing that je ne sais quoi or authentic flavor that fish sauce gives. Also, if you skip the fish sauce, you can probably also skip the brown sugar. After adding the fish sauce and brown sugar, give the broth a taste and adjust the flavors if needed. Finally, add the leafy green ends of the bok choy and let them wilt in the hot soup (the pot should still be over low heat). 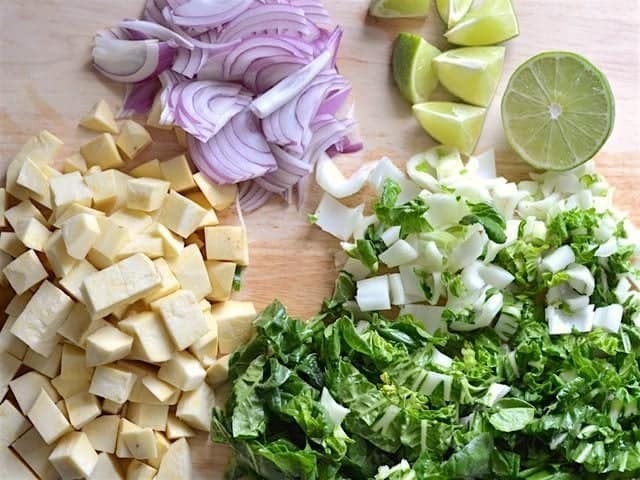 Then add your garnishes: thinly sliced red onion, lime wedges, chopped cilantro, and a drizzle of sriracha. 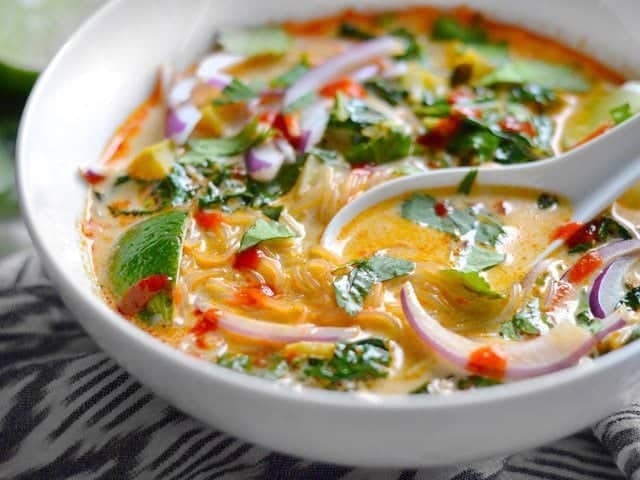 And try not to die of happiness from the tastiest Thai Vegetable Soup ever. I substituted the bok choy for baby spinach, and oh my goodness! This was absolutely delicious! This will now be one of my staple recipes! I nixed the sweet potato and bok choy since I have a pickier eater in the house and replaced with baby bell peppers, carrot, portobello mushroom, and some shredded chicken. I also used Ramen noodles since we had those on hand. Otherwise stuck to the recipe, and, wow, was this delicious! 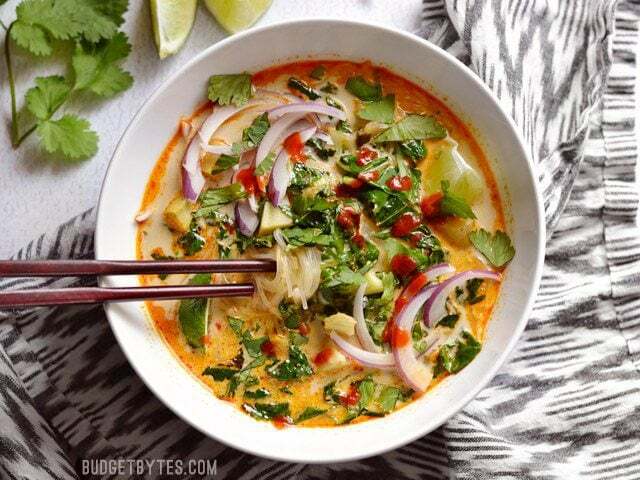 I’m such a big fan of Thai food and I think this is my favorite curry dish yet! Thanks for sharing, I love your site! So delish! I added chicken after frying the paste & before sweet potato & liquids….mmm mmm taste so good. I also tripled the coconut. What could I use instead of coconut milk, my father is allergic to all nuts? I LOVE THIS RECIPE and when refreshing my memory to prepare it tonight, figured I owe a positive review for all the others out there who are doing their due diligence. I have shared the recipe many times. This recipe is wonderful. I crave this at least a couple times a month and find it super easy to pull together on a week night. 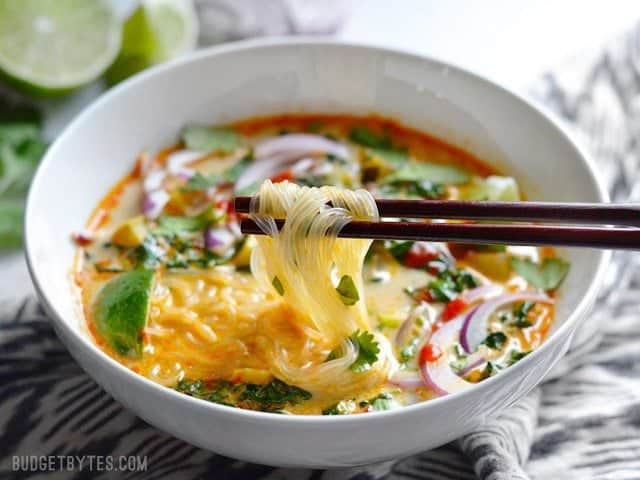 I find it a little bland as written, so I up the curry paste, sriracha, lime juice, etc. and add a red bell pepper. I also add a splash of two of soy sauce. So good! Hi. I am wondering where you get your groceries at such a great price. I live in a suburb of Atlanta and I can’t get those prices even if I go to Aldi. Where do you shop? I would love to get those prices.